Back to my vacation, which I am sure you are all anxiously waiting to hear about. So, we went to the Maritime Provinces, or at least some of them. Since Prince Edward Island (or P.E.I., to those of us in the know) was one of them, I decided to read Anne of Green Gables by Lucy Maude Montgomery. By the time I started reading the book we were in New Brunswick. We started seeing Anne of Green Gables dolls in gift shops. As soon as we got over the bridge onto P.E.I. we stopped at the first tourist area and found an entire shop full of Anne paraphernalia. Anne of Green Gables the Musical was playing in Charlottetown when we got there. Evidently, it's been playing in Charlottetown every summer since 1965. There is an Anne of Green Gables gift shop in the city as well as an Anne of Green Gables Chocolate Shop. Then we went to Cavendish, where we visited Green Gables. No, I did not have too much Anne. Another day I'll talk about the book itself. 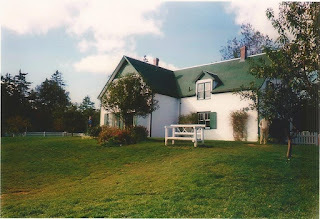 For more Anne of Green Gables images, check out my Land of Anne Pinterest board.